We don’t want to overwhelm dad with intricate craft projects, but we do want to encourage a fun activity for dad (or grandparents) to do with the kids. Make these Mother’s Day crafts in just five steps so the kids have something special to give mom on her big day. With markers, color each popsicle stick and apply a small amount of glue to one end. Turn the cupcake liner inside out and place it on top of the glue -- on the popsicle stick. Apply a small amount of glue to the center of the cupcake liner, add a craft pom pom or cotton ball. Cut leaves from a piece of paper, color and apply glue to the back of the popsicle stick. Place the leaves (colored side facing the glue) on the popsicle stick and let dry. Measure and cut the desired length of yarn. Tightly wrap a small piece of tape around one end of the yarn. String one bead onto the yarn, sliding it all the way to the opposite end and tie a knot around the bead. 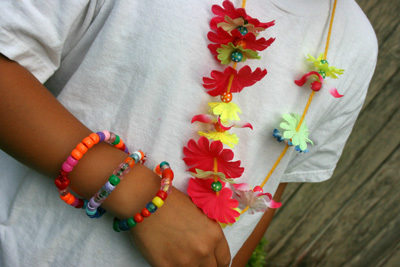 Continue stringing beads (and flowers) onto the yarn until finished, leaving 2- to 3-inches of yarn at the end. Thread the remaining yarn through the knot around the first bead and secure with a double knot. Cut a square from a piece of cardboard and then poke a hole in the center to cut a second square inside, which creates the frame. With the scissors, round the outside corners of the frame before you continue. Cut a 2-foot piece of yarn, tie it around the cardboard frame and start wrapping it tightly around the cardboard in a clockwise direction. When the piece of yarn gets close to the end, tie another 2-foot piece to it and continue wrapping -- tucking the tied ends under as you go. Secure the last piece by threading it through one of the pieces on the back of the frame, then tie it in a double knot. 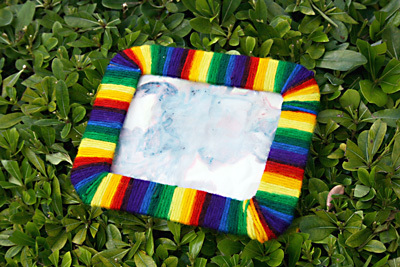 Tape a photograph or piece of artwork to the backside of the frame. Tip: The rounded corners make the wrapping easier and by using shorter lengths of yarn, you are less likely to get the yarn tangled while wrapping the frame. Ask your kids to finish the sentence, "I love mom because" while you type the answers in a document on the computer. Size each child's answers to fit inside your gallery frame openings before printing -- using one piece of paper for each frame opening. 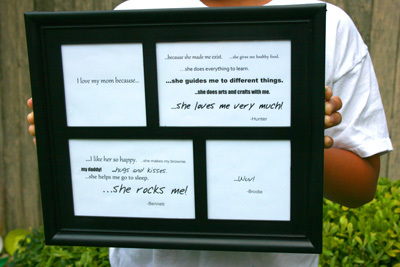 Print out the words "I love mom because" on a separate piece of paper. Cut each piece slightly larger than the size of the frame opening and tape each one inside the gallery frame -- placing the question in the top left position. Allow your children to draw pictures on their answer square prior to taping it into the frame (optional). Tip: For every child you have, you will need a space for each child plus one additional space. For example, if you have two children, you will need a gallery frame with three openings.